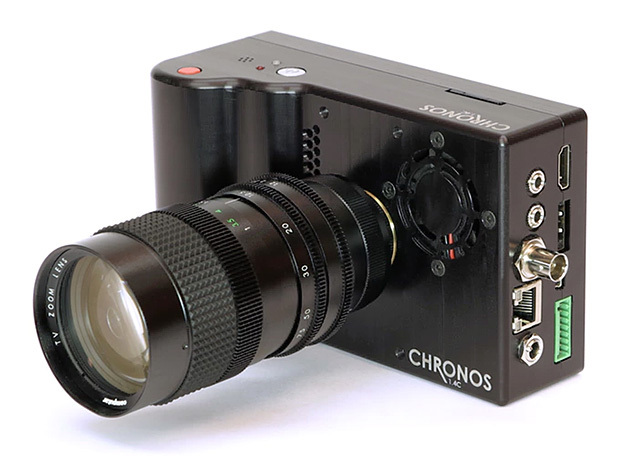 Chronos 1.4, High Speed Photography On A Budget | OhGizmo! By Jeremy Pearl on 12/06/16 • Leave a comment! It’s pretty likely you’ve seen high speed videos before. There are entire YouTube channels built around the technology (like the Slow Mo Guys), and watching these is always fascinating. But of course, making a video like that requires very expensive cameras that easily cost in the five and six figure range. If you’d like to get in on the action but don’t have the Hollywood budget, we’d like to turn your attention to the Chronos 1.4. It’s able to record up to 21,649fps, albeit at 640 X 96 resolution. Alternatively, it can shoot in full 1,280 X 1,024 resolution at 1,057fps. As a matter of fact, it’s called Chronos 1.4 for its maximum data throughput of 1.4 gigapixel per second, meaning that you can trade resolution for speed on a sliding scale while keeping the throughput constant at 1.4 Gpx/s. It looks and works like a normal camera in almost every other respect, compact enough for you to carry around in a small bag, and ready to shoot in an instant. It’s more features that we can possibly list on this article, so we suggest you visit their Kickstarter, where you can also sign up to get one when they become available. Prices start at $2,799, which is about 1/10th the price of a similar camera from the current players in this field.